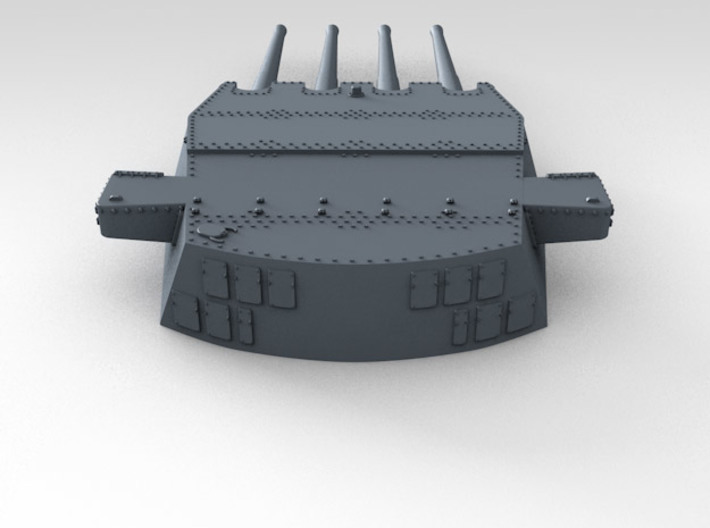 Highly detailed 1/700 Scale King George V 14" Turret set as seen in 1941 fitted with UP Launchers. 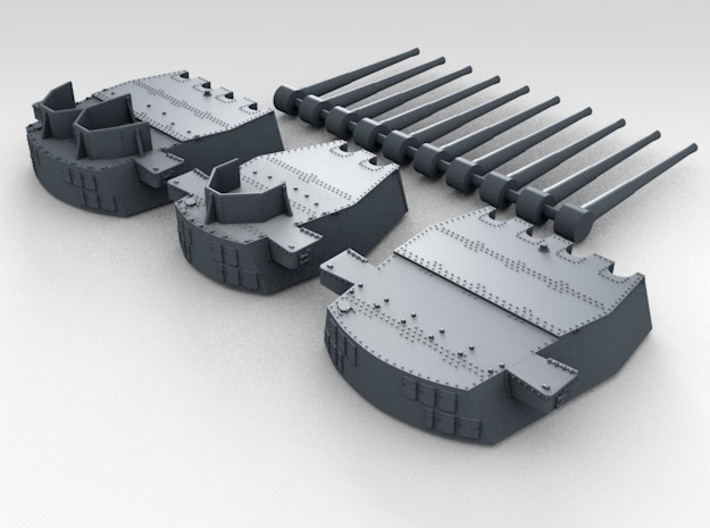 These are highly detailed replacement parts for the available kits, each turret is unique as modelled from plans and many reference photographs and information. Barrels are printed seperately and can be angled as desired. This set corrects the errors and inaccuracies on all the available KGV turret sets available. Many thanks to the Imperial War Mueseum for their vital photographic reference. Accurate armout thickness on all faces. Despite its Mark number, this was actually the first 14" (35.6 cm) gun that was exclusively designed and accepted into service by the Royal Navy. Previous 14" (35.6 cm) naval guns had been acquired either by taking over ships and guns building for other nations or by importing USA weapons. 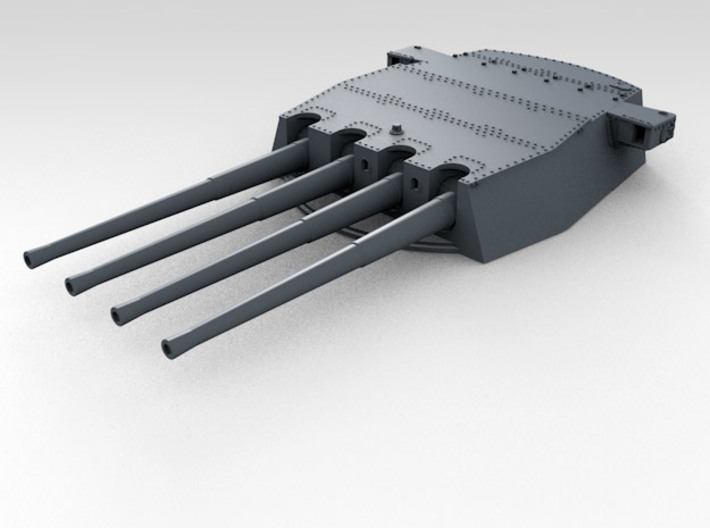 The high-velocity heavy gun had fallen out of favor in the British Navy because of the problems experienced with the 16"/45 (40.6 cm) Mark I used on the Nelson class battleships. 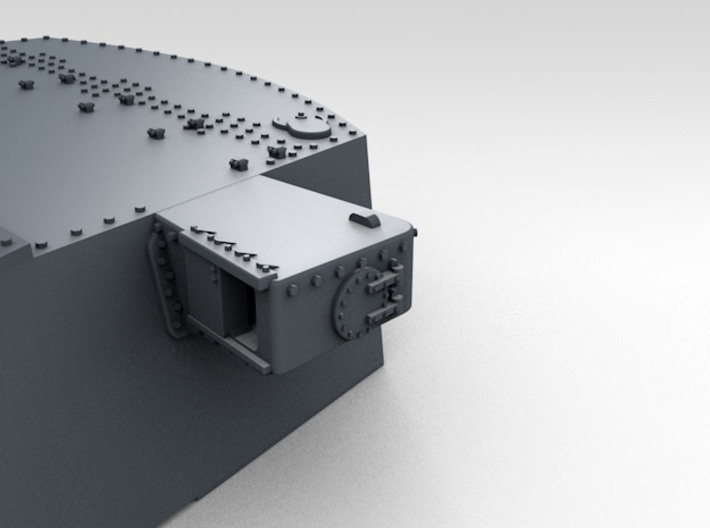 For this reason, the design of the new 14"/45 (35.6 cm) Mark VII reverted to the lower velocities used in guns produced before and during World War I. 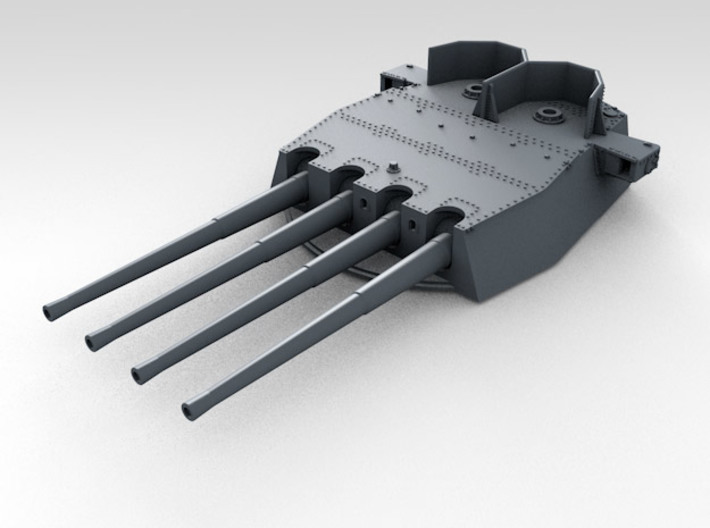 As a result, the muzzle velocity of the new Mark VII did not differ appreciatively from that achieved by the 14"/45 (35.6 cm) Mark I carried by the battleship Canada (ex-Chilean Almirante Latorre) during World War I. 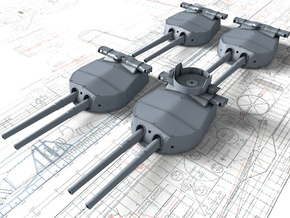 The decision to use 14" (35.6 cm) guns on the King George V class Battleships was made in order to comply with Treaty restrictions, despite the fact that other European powers were building ships with larger weapons. 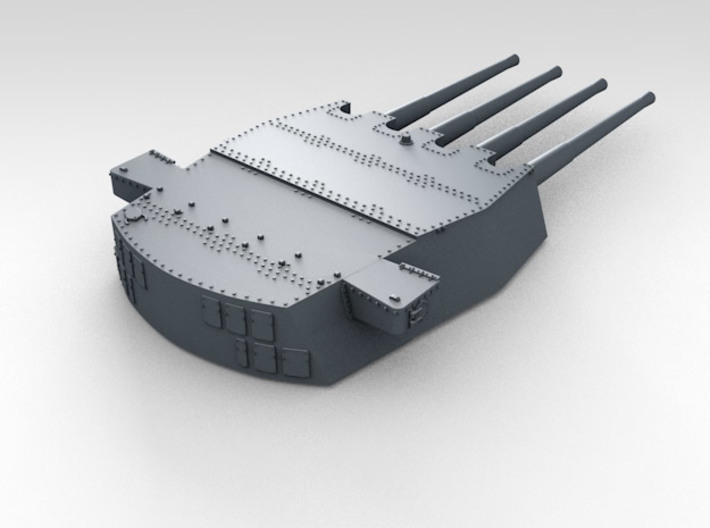 As a result, the King George V class were arguably the weakest-armed battleships built in the 1930 to 1946 time period. The design of this gun was based upon the 12"/50 (30.5 cm) Mark XIV, which was an experimental weapon completed in August 1933 to test "all steel" construction techniques. 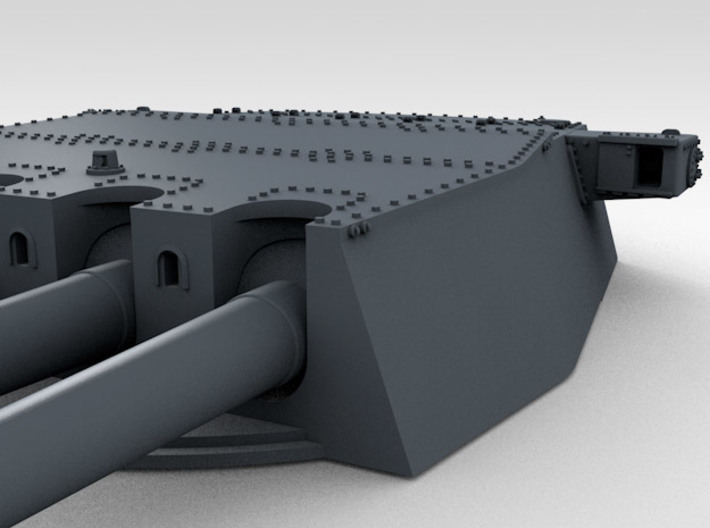 These new 14" (35.6 cm) guns were to a no-wire, radial-expansion construction, which resulted in a stronger, lighter gun that was less likely to suffer from barrel droop. 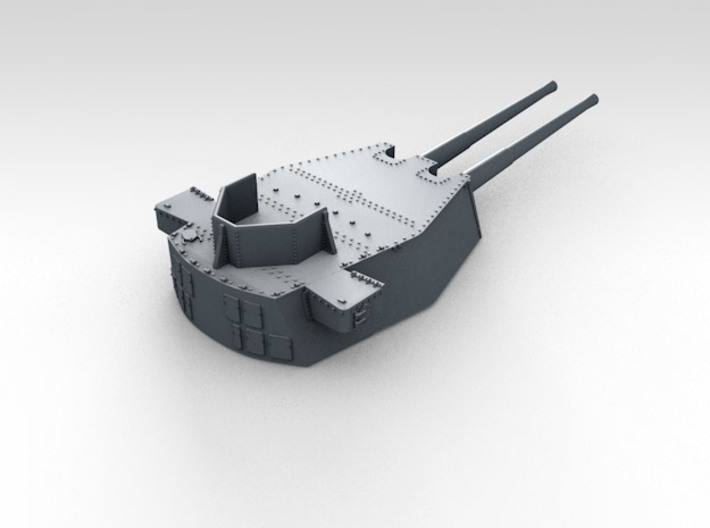 This improved design gave the British a weapon that was more accurate and had a longer barrel life than the larger 16"/45 (40.6 cm) Mark I. 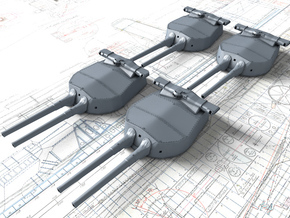 Unfortunately, the mountings for these weapons were prone to mechanical failures during the early part of the war, with both HMS Prince of Wales and HMS King George V having numerous problems during their engagements against Bismarck. Many, if not most, of these problems had been corrected by 1943. During the early part of her action against Scharnhorst at the Battle of the North Cape on 26 December 1943, HMS Duke of York scored 31 straddles out of 52 broadsides fired and during the latter part she scored 21 straddles out of 25 broadsides, a very creditable gunnery performance. In total, Duke of York fired 450 shells in 77 broadsides. However, HMS Duke of York still fired less than 70% of her possible output during this battle because of mechanical and "errors in drill" problems. 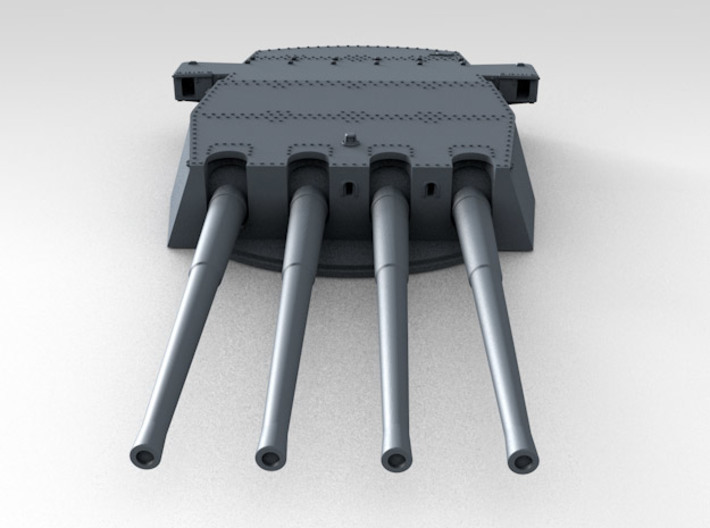 In addition to those used on the battleships, a further two guns were used as coastal artillery at Dover, but their extemporized mountings were not suitable for targeting fast moving ships. 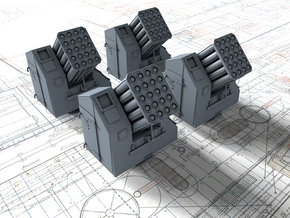 These coastal guns were supplied with a supercharge, giving them a very long range. Consisted of tapered inner A tube, A tube, jacket breech ring of rectangular external shape, breech bush located in the A tube and a shrunk collar over the A tube. Used a Welin breech block and hydraulic Asbury mechanism. Including the two trial guns, a total of 78 guns were made, 24 by the Royal Gun Factory, 39 by Vickers-Armstrong, Elswick and 15 by Beardmore. 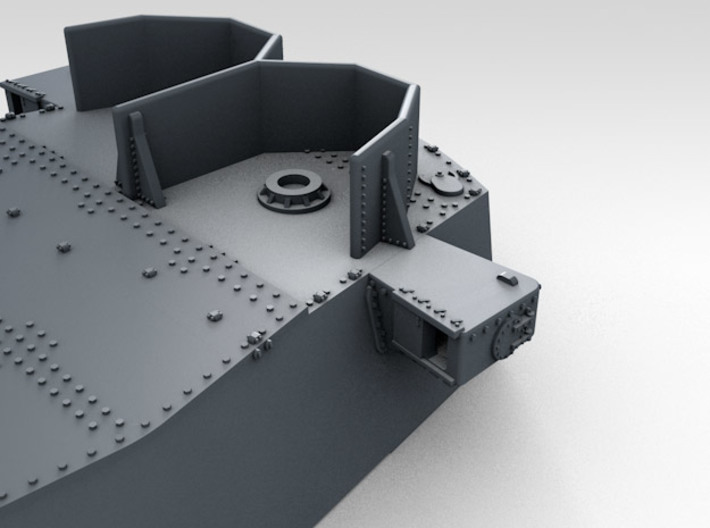 The last 46 guns produced had a different shape to the breech ring which lowered the overall weight of the gun. These latter guns used a 12.5 ton (12.7 mt) counterweight while the earlier guns used a 11 ton (11.2 mt) counterweight in order to maintain the same center of balance. The Mark VII* was a loose barrel version, but none were ever manufactured. These were the first heavy British guns in service to recoil in a cast steel cradle rather than on slides. 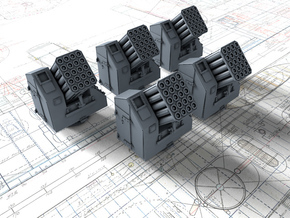 This was a feature first prototyped on the 12"/50 (30.5 cm) Mark XIV. At least one gun still exists and is currently on display at the Royal Armoury located at Fort Nelson, Hampshire, UK. Some part cleanup will be necessary. The 3D printing process uses a waxy substance to support certain part features during the printing process. Although the parts are cleaned by Shapeways, some waxy residue may remain. It can be safely removed with water and a mild aqueous detergent like "Simple Green" using an old, soft toothbrush, Q-tips or pipe cleaners. Customers report that "Bestine" and "Goo Gone" also work well.During the printing process, liquid resin is cured by ultraviolet light. Microscopic bits of resin may remain uncured. Water-based acrylic paints meant for plastics is strongly recommended. Other paints, especially enamels, may not cure on Frosted Detail 3D-printed plastics. 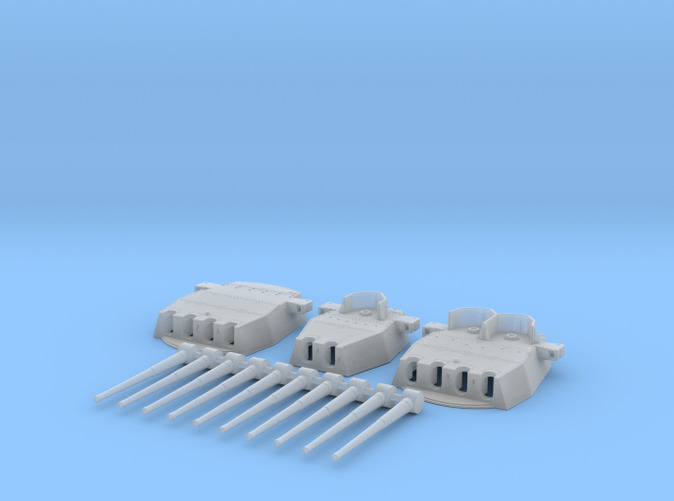 Use dedicated model sprue cutters to remove parts to minimise damage to parts.